Do you ever listen - really listen - to the soundscape in your yard? Perhaps you've never really thought about what a soundscape is. Well, it is made up of three elements. First there is something called the geophony which includes all the non-biological but natural sounds. In my yard, that might include the sound of the breeze rustling the leaves or the sound of water splashing in my little fountain. Next there is the biophony, which is just what it sounds like - all the biological sounds in Nature. Again, in my yard these would be things like birdsong, the sound of a woodpecker drumming, the chattering of squirrels, the sound of cicadas and other insects, or the sounds of frogs. Lastly, there is the anthrophony, man-made sounds. For me, these include the background noise of traffic on the highway a couple of blocks away, the intermittent sounds of neighbors' lawn mowers or other power tools, the sounds of airplanes or helicopters passing over, even the sounds of children's voices and laughter as they play. What brought all of this to the forefront of my mind was an opinion piece in The New York Times over the weekend. The writer had recorded the sounds of an area called Lincoln Meadow in California in the summer of 1988. It was just before the start of logging in the area. He found a rich medley of sound that included many species of birds as well as squirrels, frogs, and many insects. He returned a year later to record the soundscape once again, and although the area did not look that much different - the logging had been done with care not to disturb the appearance of the environment more than necessary - the sounds recorded were strikingly different. There was "a muted hush, broken only by the sound of an occasional sparrow, raptor, raven, or sapsucker." He has returned regularly for fifteen years to record the sounds and still that hush remains. The rich mix of sounds that were present in 1988 is gone, perhaps forever. This is what happens whenever and wherever we disturb Nature to build our roads, our houses, our shopping malls. We moved to our house, in an established neighborhood, in 1988. Much of the area around us was still undeveloped and there was a rich mix of bird life here, including Brown-headed Nuthatches, Pileated Woodpeckers, Red-headed Woodpeckers, Northern Flickers, and, in the spring, Indigo Buntings. Those birds are mostly missing from my soundscape now, although I do occasionally hear the little nuthatches and Pileated Woodpeckers. But the Red-headed Woodpeckers and Northern Flickers have been gone for years and although some Indigo Buntings still pass through here, they are not in anything like the numbers that I used to see. We continue to change the land. We can hardly help it. But as we do, we need to be aware of what we are doing and make an effort to do whatever we can to ameliorate the damage that we do and to set aside areas that are left natural for the birds and other animals. It is little enough, but it is the least that we can do to try and preserve Nature's soundscape. This week in the garden, the midseason daylilies are starting their bloom. A sunshine yellow hibiscus is brightening things up in its corner of the garden. Every day it seems that a different crinum opens its blooms. This datura has already bloomed and is now growing its interesting seed pods. The mixed sunflowers are still showing various kinds of blossoms, including this attractive dark maroon one. The white yarrow is showing a few midsummer blooms. A few annuals, like these marigolds, are adding some color to the garden. And Aunt Marcelle's old abelia is blooming, drawing in the pollinators like this native bee, a large carpenter bee. Also blooming in the garden this week has been a new hatch of mosquitoes which has made life fairly miserable for anyone trying to spend any time out there. Ah, well, more food for the frogs and birds. I hope your week in your garden has been a happy one. Along the back fence of our fairly big suburban lot is an area that we've allowed to remain wild over the years. This wasn't really planned. It just sort of happened and has evolved as things in Nature will. The "wilderness" consists of a hedgerow of shrubs that have been planted by birds and other wildlife over the more than twenty years that we have lived here. Consequently, since the plants were selected by wildlife, they are all wildlife-friendly and are full of food for critters at certain seasons of the year. The most prevalent plant in the hedgerow is common elderberry, Sambucus nigra canadensis. The airy white umbels that are its blooms cover the shrubs from spring until autumn. When the flowers mature, these shiny purple berries develop. They don't last long. As you can see here, many of the berries from this bunch have already been picked. The birds love them! Our Northern Mockingbirds particularly go crazy for these berries, but other birds get their share when they can get past the sharp eyes of the territorial mockingbird. Since the shrubs have such a long bloom period, many of the berries last into the late fall and are a significant part of birds' diets when a lot of other wild foods have been exhausted. Some humans also harvest the berries to make tasty wines, jellies, candies, pies, and sauces. The plant has some medicinal uses and was utilized by Native Americans for that purpose and as a useful dye. But in my yard, the plant is strictly for the birds. Pokeweed (Phytolacca americana) is another plant that is very common in our "wilderness" because it is another plant that has berries that are much loved by birds. The flowers are fairly insignificant. Most of the petals here have already fallen off, but just at the tip of the raceme, you can see a few of the blossoms hanging on. Pokeweed is a very robust plant that can grow almost ten feet tall in ideal conditions. The leaves of the newly emerged pokeweed in the spring are prized by some as greens for the table. The gourmand must beware though for those leaves are poisonous! They must be boiled twice and the first water thrown out before they can be eaten. I had an uncle who swore that the leaves were tastier than spinach and he looked forward to eating them every spring. Since he lived well into his 90s, he could be the poster boy for poke salad, or "poke salet" as he called it. The berries of the pokeweed mature more slowly than the elderberries and so they stay on the plants longer as food for the birds. When they do mature, they have the same shiny purple-black color as the elderberries and they were used by Native Americans as a very effective dye. Another berry planted by the birds along my back fence as well as in other favorite perching places around the yard is the beautyberry (Callicarpa americana). It is actually one of my favorite native shrubs and I use it pretty extensively in my garden, sometimes moving the small plants that have been started by the birds to my ideal (from my viewpoint) locations. Again, the flowers of the shrub are fairly insignificant but the berries, once they have matured, make a splendid display. The berries do take longer to mature than either the elderberry or the pokeweed and so they stay on the shrub longer, often even into the winter when they are much appreciated by hungry birds. There is also a cultivated variety that has white berries. I have one of those in my garden as well and, for some reason, the birds always finish off those berries before they start on the purple ones. Thanks to Gail at Clay and Limestone for hosting Wildflower Wednesday again this month. Don't forget to visit her blog and say "hi" for me. What's happening in the garden this week? Well, in the bluebird box on the south side of the garden, my bluebird pair are raising their second family of the summer. As I always say, you can't have too many bluebirds! In other bird news, the hummingbird traffic has picked up a lot this week. I think the fall migration has already started. Elsewhere in the garden, as I reported in my Bloom Day post earlier in the week, the Duranta erecta has been drawing in butterflies by the dozens! The Tiger Swallowtails seem to be particularly attracted by the plant. I've seen as many as four of them nectaring there at a time. The butterfly in the foreground has lost one of its "swallowtails," the one on the left. You can also just see the edge of another butterfly in the background. The milk and wine lilies started blooming this week. These are a bit wilted from the heat and humidity because the picture was taken late in the day. The first blooms of the Clerodendron bungei, sometimes called "Mexican Hydrangea," have also started to open. The 'Belinda's Dream' rose is blooming again. And so is the 'Lucifer' canna. In the nearby pond, a goldfish in the same colors as 'Lucifer' comes up for a look. And he's soon joined by one of his mates as they enjoy the late afternoon sun. Things are quiet in the garden this week, except for the song of the cicadas during the daylight hours and the song of the frogs at night. It is high summer here - time to kick back and take it a little easier. I can do that. Did you happen to see HBO's latest documentary, Birding: The Central Park Effect? It premiered last night, but, if you care to see it, I believe it will be showing a few times later in the week or you can watch it on HBO On Demand, if you have that feature. It's worth a look if you are interested in birding or birds or even if you just have a concern about the environment and what is happening to it. I didn't see the show last night because I was watching the Astros game (Finally won one! Yay!) but I watched it today with my two cats. The bird photography and sounds were so realistic that it kept the cats' attention. In fact, it even had them jumping at the screen on occasion! The film follows a group of regular birders in New York's Central Park through a year of watching the birds there. Some of them are fairly famous (at least in some circles) - people like authors Jonathan Franzen and Jonathan Rosen - but most of them are just regular people, New Yorkers with typically busy lives who are also obsessed by birds. One of the most interesting of the lot for me was a woman with terminal breast cancer who leads bird walks through the park and has done for many years. She explained what the park means to her, basically that it takes her out of herself and out of her pain and reminds her that she's still here. She's still alive. And there are still birds to see and to share with others. Another featured birder was a young African-American man who said that his friends know that he is going to disappear in the spring and that they will not see him again until spring migration is over. He was particularly interesting to me, because, so often, especially in this area, birding is perceived as a very white activity. It's heartening to see that this is not true everywhere. This man, Chris Cooper, had formulated seven reasons why birding is interesting and important. Basically, his reasons had to do with the beauty of the birds, the connection they give us to Nature, studying birds and bird behavior as an entry to the world of science, etc. His last reason was "the unicorn effect." Essentially, this means that you come to know birds through studying them in field guides. You memorize them long before you ever see them. And then one day you finally see that picture that you've been studying come to life in the field and it's like the sensation of watching a unicorn emerge from among a stand of trees. Any birder will know what he's talking about. Those are some of the birders, but what of "The Central Park Effect"? This refers to the fact that migrating birds are funneled into this green oasis in the middle of a highly urbanized area, so that at the height of the migration seasons, you can get millions and millions of birds coming into the park to feed and rest. Because they have nowhere else to go! This is a boon for the birders, of course, and it's certainly a boon for the birds that there is such a place. It is also sad for the birds that it is one of the few such places left. It's not only New York that has a Central Park effect. Cities all over the country, with their urban parks, have the same effect, albeit perhaps to a lesser degree. Houston, with its many parks and nature preserves, has many such oases to sustain the birds on migration or even during nesting. It's one of the reasons that ours is one of the birdiest places in the country. But most, if not all, cities have some such "natural" areas, even if, like Central Park, their "Nature" is completely planned and landscaped by humans. These areas are absolutely essential to the survival of birds and much other wildlife in our urban society. One's own garden can play a similar role. Even a postage-stamp-sized plot that is planned and planted for the benefit of wildlife can be a haven and a life-saver for hungry birds and other animals. That is why the growing popularity of habitat gardening has been one of the more heartening trends in gardening over the last few years. While birding probably will never be considered by the general population as a "cool" activity, for reasons that Jonathan Franzen explains in the film, even those who are not bird-addicted may gain a better understanding of their relatives and friends who are by watching this interesting documentary. I was on the road when Bloom Day rolled around last month and didn't get to participate in my favorite monthly meme, so I wanted to be sure that I got my post done early for July. It's been an interesting week here - very, very wet, with more than ten inches of rain falling in a three-day period. Along with the rain came a bit of windy, stormy weather. The result of all that is that a lot of the blooms in my garden look rather beat up just now. Nevertheless, let's take a look at them, shall we? Maybe the worst of the lot is this 'Rouge Cardinal' clematis which took quite a battering. July means it is time for the coneflowers to bloom. July is also sunflower time. I bought a packet of mixed seeds earlier this year and planted them in the garden and now they are giving me a variety of blooms. This one blooms on a shorter stalk than many of the others. This one is a slightly different color. The bumblebees like this one! So do I. Here's a pretty yellow one that certainly looks sunny. This one is almost pink. Is there any happier-looking flower than the sunflower? The Brugmansias (Angel's trumpets) are in full bloom now. They appreciated all the rain received this week. And so did the Esperanzas (Yellow bells). This old heirloom buddleia has been in bloom since early spring. 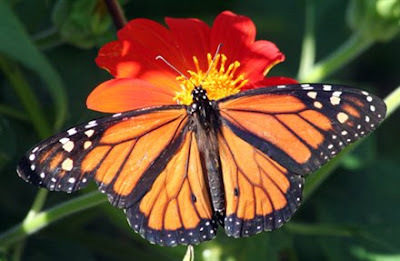 Its blossoms are not as full and colorful as the newer varieties but the butterflies love it just the same. Texas sage's blooms are triggered by the rain. It has been blooming a lot this summer. The evergreen wisteria has been in bloom for much of the summer. The nectar in its blossoms is highly prized by butterflies like this little skipper that uses its long proboscis to extract the sweet stuff. The blossoms of the almond verbena are sweetly scented and they perfume the air in their corner of the garden. The Hamelia patens' red-orange blossoms are frequently visited by hummingbirds and butterflies. The oddly-shaped blooms of the shrimp plant are also great favorites of hummingbirds. The crocosmia has been blooming for several weeks now. Summer phlox also brightens the garden for weeks. 'Montrose Purple' vitex is now on its second flush of bloom. Caesalpinia pulcherrima. the 'Pride of Barbados' plant, also has a long bloom period. But the star of the garden on this Bloom Day is the Duranta erecta, "golden dewdrop," and not just because of its blooms. When I went to take its picture for this post, I found the shrub alive with butterflies! There were several different varieties of butterflies sipping from the flowers, including Gulf Fritillaries and various skippers, but the majority of the visitors were members of the swallowtail clan. The two on the left here are Giant Swallowtails, the one on the right is a Tiger Swallowtail. Most of the butterflies, like this Giant Swallowtail, had damage to their wings which could have been from predators but I suspect a lot of it came from the heavy weather we had this week. Even somewhat tattered, this Tiger Swallowtail is still beautiful. I hope this July Bloom Day finds you and your garden flourishing. Thanks once again to our hostess Carol of May Dreams Gardens for continuing to bring us Bloom Day each month. There's only one word to describe this week in the garden - WET! My garden had not seen this much rain in such a short period of time since Hurricane Ike in 2008. Of course, in 2010-2011, we were mired in a terrible drought. For most of last year, we didn't get much more rain than we got this week, so this has been quite a turnaround in our fortunes, one which I'm sure our long-suffering trees have relished. I went out and slogged through my garden this afternoon to see what was what. I have to admit it was a depressing sight. Things had been pretty beat up by the rain and there was still water standing in the lower spots of the yard. By the time my lawn service is able to get back here to mow the grass, I fully expect that it's going to be "as high as an elephant's eye." There were lots of butterflies out nectaring this afternoon. I wonder what they do when it is raining as heavily as it has this week? Obviously, such fragile wings would not be able to navigate in heavy weather such as we've had, so I assume they must hole up somewhere under cover and wait for things to clear up. I saw lots of tiny butterflies about, mostly various kinds of skippers, and there was a lovely Giant Swallowtail and a Palamedes Swallowtail flitting about. I ran to get my camera to try to get some pictures and, of course, by the time I got back outside, most of them had disappeared, but I did manage to get a few to pose for me. This Clouded Skipper was resting on a cucumber leaf. A Gulf Fritillary was sipping from a stand of 'Mystic Spires' salvia, a favorite with many butterflies. There were lots of sulphurs around the yard, but they are so "flighty" that I find it hard to get one to sit still long enough for a picture. I finally captured one sipping from a crocosmia blossom. I'm not sure which species of sulphur it was. I couldn't get a picture of its open wings which would have clinched the identification, but I thought it might be a Dog Face Sulphur. I stopped by the pond to check on my goldfish and found that the water was clear all the way to the bottom of the pond. That's unusual. There's almost always a bit of algal buildup that obscures the view, but, evidently the rain had flushed all of that out. I could see all eight of the colorful fish as they swam around their watery home. One species that has certainly gloried in this week's weather has been the frogs. Stepping into the backyard at night, one is overwhelmed by the sound of all those amphibian voices, rejoicing in the wetness. I rejoice, too. Although, now, I wouldn't mind a few days of sunshine. How much did it rain at your place? I confess - I love cannas!